We closely monitor every stage in the making of this product, ensuring that consistently high quality standards are observed. It is made with carefully selected Normandy cheeses (Camembert, Pont l’Eveque and Livarot), chosen by our Master Cheesemaker. Discerning palates will appreciate the mild cider flavour notes and a hint of Calvados. 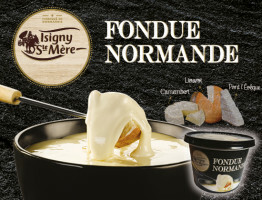 A unique fondue made from Normandy’s finestingredients. 1. Remove both the lid and the linner film sealing the pot. 2. Put the pot in the microwave and heat for two minutes (900W). 3. 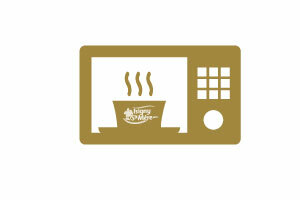 Stir thoroughly to get a smooth texture and return the pot to the microwave for a further two minutes. 1. 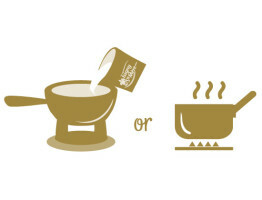 Turn out the contents of the pot into a pan. 2. Reheat for five minutes, stirring regulary to get a smooth texture.